We are developing MTIL algorithm (Multidimensional Time-series Incremental Learning algorithm) to discovery of frequent time-series patterns from a large amount of multidimensional sensor data such as multi-modal data and learn it incrementally (Fig.1). 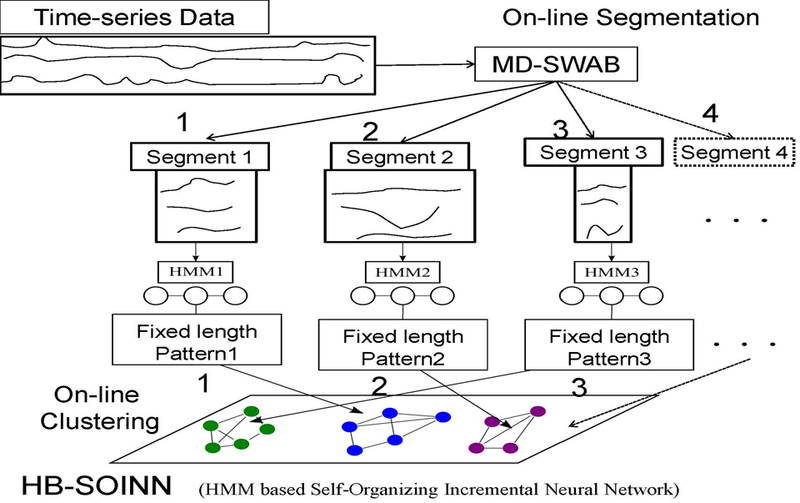 The algorithm is composed based on an on-line segmentation algorithm (MD-SWAB)  and an incremental clustering algorithm (HB-SOINN) . It has three advantages. First advantage is to be able to detect frequent time-series patterns fast because it don’t need to keep whole time-series data. Second advantage is to be able to report the number of categories of time-series patterns. Third advantage is to acquire new category patterns incrementally. Human-Human and Human-Robot interaction data and categories of it increase dynamically and incrementally because interaction protocol changes in time. The algorithm helps to analyze the interaction data. Fig.1: MTIL (Multidimensional Time-series Incremental Learning) algorithm. Shogo Okada, Satoshi Ishibashi and Toyoaki Nishida: “On-line Unsupervised Segmentation for Multidimensional Time-series Data and Application to Spatiotemporal Gesture data”, IEA/AIE2010, Accepted for presentation. Shogo Okada, Yoichi Kobayashi, Satoshi Ishibashi and Toyoaki Nishida: Incremental learning of gestures for human–robot interaction, Online First, AI & Society, 2010.